Yet again we had rain to raise the bayou. It was half as much rain, but it had half as much time to drain out, so we were expecting another moderately high water day. It turned out to be quite handy. We arrived at the park early and checked out the bayou. It was indeed a few feet above baseline, but the current was minimal. We’d be unable to wade, but the water shouldn’t make the work that difficult. We took a quick water surface temperature reading and found a much more pleasant 59F, up considerably from a few weeks ago. With the weather forecast calling for a beautiful day, we couldn’t ask for much better. Then as we were starting to unload, up rode a motorcyclist. He’d wasn’t going to be able to come along this time, but he wanted to drop by to check in. We had a nice chat, and he gave us a hand getting everything to the bayou. The day *was* getting even better. Soon enough, we were heading down the bayou. Comparing the water level to the last trip wasn’t quite straightforward, as we didn’t really have any fixed reference points at first, but then we came to the small bridge just downstream from the park. 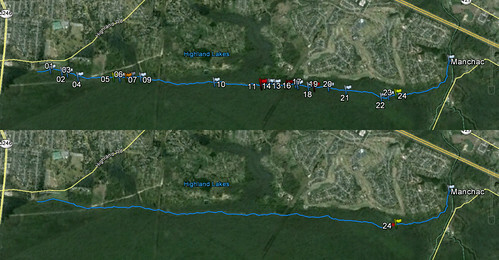 Using it as a reference, we noted the bayou was very close to the same level it had been the previous run, i.e. “duck” but not “scrape” or “bump” at the bridge. There was just a bit over two feet or so of clearance. On the way back, with the water level a few inches lower, we actually measured it and found 2.5 feet of clearance between the bottom of the bridge and the water. 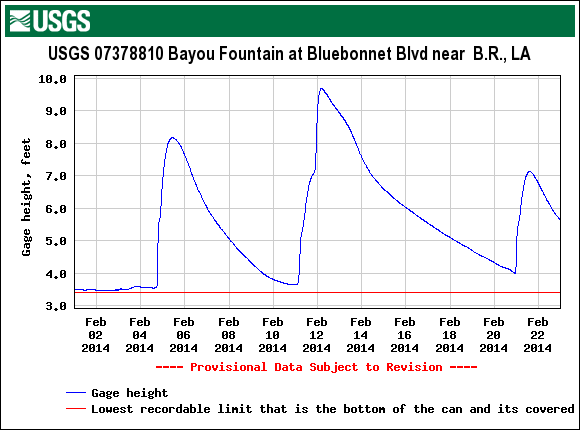 The nearest gauge is at Bluebonnet, which is about 2-1/4 miles upstream, but it should be good enough for at least a rule of thumb. Given the gauge reading when we measured the bridge clearance, we’ll call the bottom of the bridge “8.3 feet” on the Bluebonnet gauge. The big rains we’ve had recently have raised the water to bridge level a few times, but only for brief periods. Still, to have a better reference, we hung a marker off a tree overhanging the bayou at Highland Road Park. The bottom of the bridge is marked with a T (and the top of the bridge is marked with a cross piece, just for reference — it’s 2.5 feet thick). The marks below the T are in one-foot increments, so it should make it easy to tell how high or low the bayou is. (This time it was bridge minus 2.5 feet.) Look just downstream of the entry. As we continued down the bayou, we again ran into some reblocking at #11, just like last time. There was obviously something underneath, so we paused our forward progress and went to work on it. Sure enough, we found a submerged log that was causing the issue. It was solidly fixed in place, so we broke out the tackle. I moored the canoe and winch platform to a convenient tree at the far bank, and Mike rigged up the log for the pull. As we started to put muscle into the pull, we noticed that another log at the near bank was apparently part of the same log. 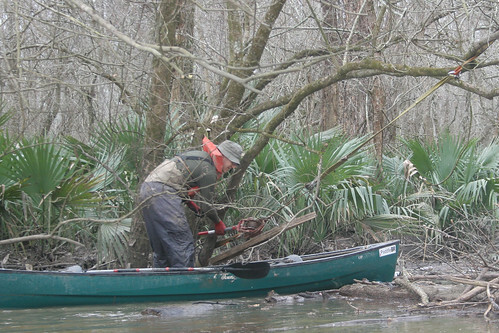 Then we noticed that a trunk all the way across the bayou was moving, too. Then it started to come out of the water entirely. At that point I had to pause and ask Mike to get a photo — it looked like I was fighting a giant swamp dragon… monster… beast. Eventually it did roll over, although it took two sets to force the issue. We were puzzled as to how it could’ve found itself where it was. As far as we can fathom, it must have been embedded in the bottom and somehow worked its way up in the high flow, as it certainly couldn’t have floated there. It’s out of the way now, regardless, and isn’t going to catch things in the canoe channel anymore. Once or twice on the way downstream we caught up with bits that had been collected by the swamp monster, but they posed no problem and on we went. When we arrived at #19, the last of the big logjams, we figured we were in for a good day’s work, probably a couple, to get it all free and clear. We started at the downstream end and started into it. Almost immediately, the first part just disintegrated. It had been caught in some submerged branches and vines, and with those pulled free, everything just went on downstream. We shrugged and turned our attention toward the next piece. While it wasn’t quite as willing to give in, it also more or less fell apart as we pulled the long logs free and floated them to the branchy side. It was with only slight regret that we noted that we could’ve made a video in real time, not even time lapse, to watch it go. This far down the bayou, there’s really nowhere left inside the banks to wedge things in, so as #19 came apart, we transitioned into terminal guidance. Instead of trying to lock things in, we were now playing a completely different game: Chase the Flotsam. Each time we came upon the flotsam jam, we’d power through it (the push pole we pulled out of jam #15 was convenient). Then we’d free it up and send it on down to the next spot. Sometimes we’d get a few dozen yards at a time, and other times we’d have quite a nice paddle before we’d hit the next catch point. We made phenomenal progress before we finally had to call it a day. The top map shows all the blockages we found in the initial exploratory expedition, with the red (and orange) flags marking the major logjams. The red dot in the bottom map shows where we turned around at the end of the day this time. 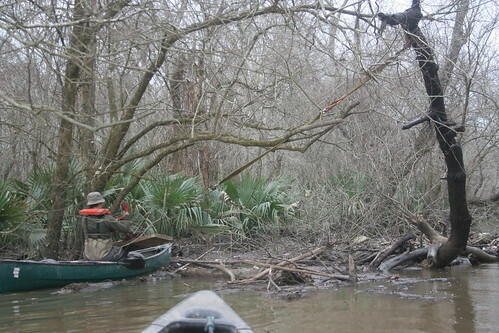 We made it to within 80 yards of the last numbered blockage, below which the bayou opens up wide. It was 4:30pm by that point, so we had to call it a day and head back to the park, but we have a very good chance of breaking through next trip. There was not a single blockage all the way back to the park, as the lack of markers quite wonderfully illustrates.